Reme mber this number – 332. That’s the number of homes our Sokoler medley team sold last year. Yet, despite the enormous success there are still frustrations. There were a small number of homes that never sold. This may sound ridiculous to you but I did lose sleep wondering what was wrong, why didn’t those homes sell. We’ve teamed up with 1000 top agents around the country through active rain to study why a home doesn’t sell. If you’re thinking about selling a home this year the following information is very important to you and could mean the difference between listing and selling your home and just listing your home. As top agents we found the number one problem to be over pricing your home. It happens and 77% of the cases where a home doesn’t sell and we’ve seen sellers overprice a listing because they need to get money out of it. Yet because of new appraisal regulations there’s no way a seller will get anywhere close to their asking price. It’s a simple fact if homes in your neighborhood are selling for less don’t expect your home to sell for more. In 34% of the cases were a home doesn’t sell its because the seller has made it difficult for the home to be shown. Selling a house is a job and it can admittedly get tiresome. But buyers and their agents are on a schedule, their goal is to see as many homes in a day to make a decision. Often the homes are spread out over a section of the city. Doubling back to try to accommodate schedule just won’t work. A buyer would rather skip a house that’s not available at their selected time then lose time seeing homes that may also serve their purpose. 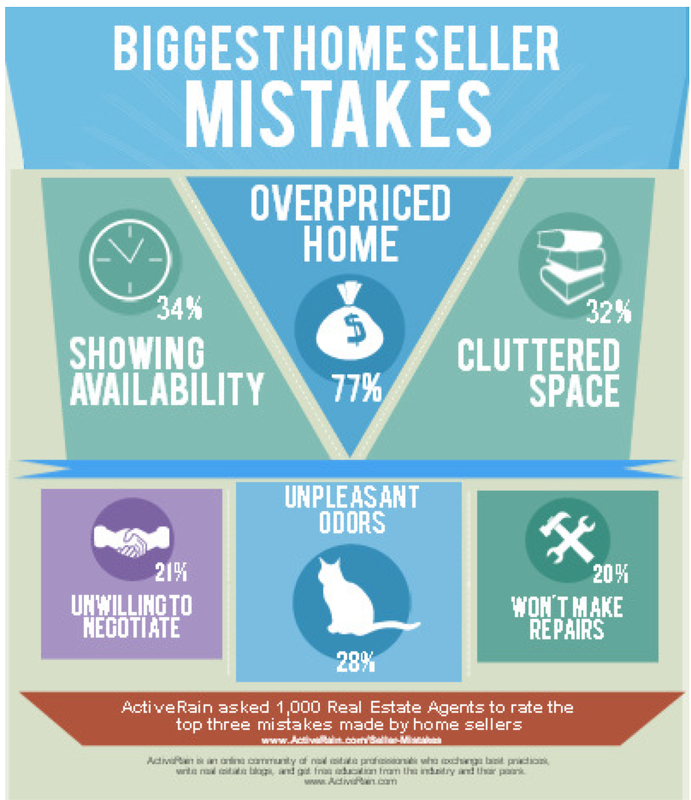 32% of the homes that didn’t sell showed cluttered. When it comes to selling a home less is more. Less furniture in a room takes that room look bigger, less knickknacks on a kitchen countertop but only makes the kitchen look bigger and more like a model but it also eliminates the buyers concerned that there’s not enough countertop space or not enough covered space. The other items on our list are pretty straightforward. Cat and dog owners need to be eliminated in any way possible. Be prepared to make repairs and be flexible with regards to negotiating. These last three items are deal breakers for a number of buyers and in some homes they are also related problems. Often an animal has chewed wood work or left stains and odors. Those items should be remedied before putting a home on the market but in most cases will play a part in a reduced sell price if visible while on the market. We have one home right now that’s been listed for close to a year. It’s spectacular and features great upgrades. But the majority of the feedback has centered on pet odors. It’s obvious even a great home and a good price will not overcome problems like pet odors.